Powerlet manufactures rugged electrical devices and cables for the cold, wet and high vibration powersport environment. For years, Powerlet's founder recognized the need for dependable wiring products designed specifically for the powersport industry. By offering the most complete line of expertly engineered power outlet kits, cables, connectors, mounting systems, Luggage Electrix, and heated clothing, Powerlet customers can fully enjoy any modern electronic device while using their motorcycle, scooter, snowmobile, all-terrain vehicle (ATV), utility vehicle (UTV) or personal watercraft (PWC). Originating as a durable electrical connector, authentic Powerlet connectors quickly grew in popularity throughout the powersport industry. What started as a connector has developed into the Powerlet Equipped product line. Today, Team Powerlet provides a system of electrical components not found anywhere else in the world. A key to Powerlet's uniqueness is compatibility with todays consumer electronics. So if you want to safely connect your new Apple 3Gs iPhone to your BMW motorcycle, look to Powerlet for a reliable powersport solution. The Powerlet Equipped System is a group of power outlets, cables and electrical devices that are engineered to work together. All of these outlet kits, cables and devices use the popular Powerlet plug or socket (connectors). Designed for simple plug & play operation, a single 12V Powerlet outlet can now power virtually any electronic device. Need a rugged iPod or mini-USB cable designed for powersport use? Want to power heated clothing or use your favorite battery charger? Genuine Powerlet connectors can also be installed on all brands of motorcycles, ATVs, PWCs and snowmobiles including Aprilia, Buell, Harley-Davidson, Honda, Moto-Guzzi, Suzuki, Kawasaki, Yamaha and others. One outlet can do it all when your vehicle is Powerlet Equipped. Who Uses Powerlet Compatible Connectors? 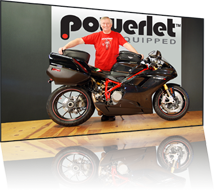 Six of the eleven major Powersport vehicle manufacturers use Genuine Powerlet or 'Compatible with Powerlet' power outlets over cigarette power outlets. 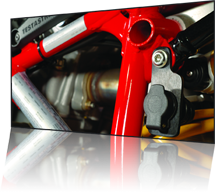 BMW, Ducati, KTM, Indian, Triumph, Victory and John Deere vehicles use 'Compatible With Powerlet' connectors. Genuine Powerlet plugs and sockets are fully compatible with the manufacturer's factory power outlets. All of the brands that come with a factory outlet can also have second and third outlets installed. Powerlet connectors (outlets) conform to a worldwide DIN ISO standard and provide a "snap-fit" so they do not disconnect while you are driving. Automotive cigarette outlets lack a manufacturing standard often causing a loose fit. Cigarette connectors (outlets) are also not rated for high currents. Powerlet sockets are smaller, vibration proof and can handle more power than a standard automotive cigarette socket. Whether you are on the road, in the woods or on the snow, you can reliably power your consumer electronics with a Powerlet connector. Getting ready for a trip? Need Powerlet parts overnight? No problem, it happens all the time. Call our customer service reps at 586-932-6886 and let them know you are in a pinch. Or, if it is after hours, select one of our extensive overnight shipping options on-line. We will even ship to a hotel when you are out on the road. Think of it as factory support, anytime, anywhere. How Do I Become Powerlet Equipped? Becoming Powerlet Equipped is easy. You can see our products at a local Powerlet Authorized Dealer, visit one of the many websites that offer Powerlet Products, or if you prefer select our Shop By Vehicle tool on our Products Page. This tool will help you identify which Powerlet Socket Kit best fits your specific motorcycle, budget and needs. We will then send the kit to your home, business or local dealer for installation. 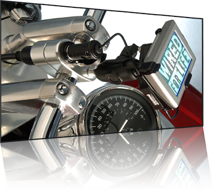 Please enjoy the benefits of being Powerlet Equipped responsibly - ride safe. Currently, the Powerlet website supports motorcycles and scooters. For help with sales and installations of the Powerlet product line on snowmobiles, ATVs, UTVs and personal watercraft, please call 586-932-6886 and ask for Non-Motorcycle Technical Support. 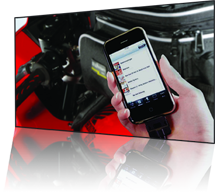 Team Powerlet looks forward to providing on-line support in the future for all powersport vehicles.